According to NAR, existing-home sales 2.0 percentage points to a seasonally adjusted annual rate (SAAR) of 5.60 million. NAR Chief Economist Lawrence Yun says the bump in sales is due to would-be buyers finally deciding to buy homes after a summer of fears about low inventory and high home prices. The silver lining revealed in last month’s National Association of Realtors existing-home sales report has gotten a bit brighter thanks to would-be buyers coming out of hiding and taking advantage of a healthy autumn housing market. In October, existing-home sales rose 2.0 percentage points to a seasonally adjusted annual rate (SAAR) of 5.60 million — up from an upwardly revised 5.49 million in September. 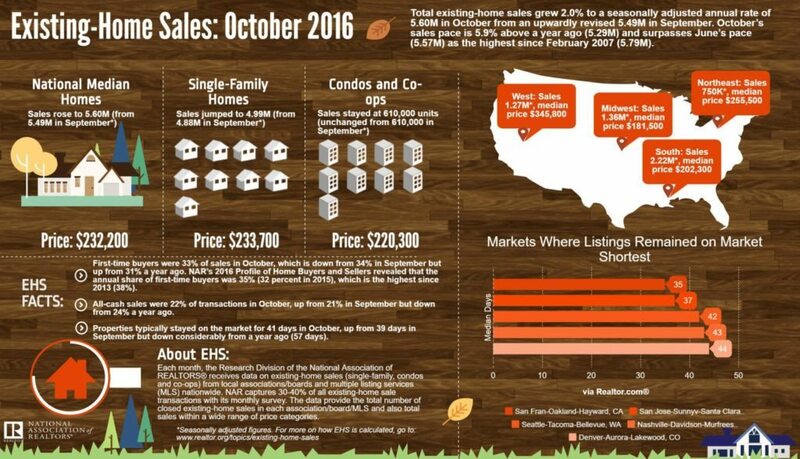 October’s sales pace is 5.9 percentage points above October 2015 and blew past June’s pace of 5.57 million — which were the highest numbers seen since February 2007. All regions experienced an uptick in sales, and distressed sales increased 1 percentage point to 5 percent, which is still lower than a year ago. The median existing-home price for all housing types in October rose 6.0 percentage points to $232,200, which marks the 56th consecutive month of year-over-year gains. Meanwhile, total housing inventory took a small hit and declined 0.5 percentage points to 2.02 million existing homes available for sale. Inventory is now 4.3 percentage points lower than a year ago — the 17th consecutive month of year-over-year declines. Unsold inventory is at a 4.3-month supply, down 0.1 percentage points from September. NAR Chief Economist Lawrence Yun says October’s impressive existing-home sales is part of an “autumn revival” that has been key to turning around an otherwise hard year for the housing market. Trulia Chief Economist Ralph McLaughlin weighed in on the “autumn revival,” and said President-elect Trump could help boost inventory — the thorn in the housing market’s side. “President-Elect Trump could help boost inventory by implementing policies that would encourage investors to sell homes they bought during the foreclosure crisis, many of which are suitable for starter home buyers,” he said in a statement. Furthermore, McLaughlin said, increasing inventory is key to restoring the housing market to pre-recession levels. Distressed sales, which include foreclosures and short sales, were at 5 percent — a 1-percentage point increase from September and a 2-percentage point drop from October 2015. Four percent of September sales were foreclosures and 1 percent were short sales. Single-family home sales were at a SAAR of 4.99 million — a 2.3 percentage point month-over-month rise and a 6.6 percentage point increase from October 2015. The sales price for single-family homes increased by 5.9 percentage points to $233,700. On the other hand, existing condominium and co-op sales stayed steady at a SAAR of 610,000 units, unchanged from last year. The median existing condo price was $220,300 in October — up 6.2 percentage points from 2015. In the Northeast, existing-home sales jumped 1.4 percent to an annual rate of 750,000, up 1.4 percent from a year ago. Median price: $255,500, a 2.9 percent year-over-year increase. In the Midwest, existing-home sales increased 2.3 percent to an annual rate of 1.36 million. Median price: $181,500, a 5.8 percent year-over-year increase. In the South, existing-home sales rose 2.8 percent to an annual rate of 2.22 million. Median price: $202,300, a 7.4 percent year-over-year increase. In the West, existing-home sales rose 0.8 percent to an annual rate of 1.27 million. Median price: $345,800, a 7.8 percent year-over-year increase. Existing-home sales are based on transaction closings from MLSs and include single-family homes, townhomes, condominiums and co-ops. Seasonally adjusted annual rates are used in reporting monthly data to help accommodate for seasonal variation; the annual rate for any given month represents what the total number of actual sales for a year would be if the pace for that month were maintained for a whole year.